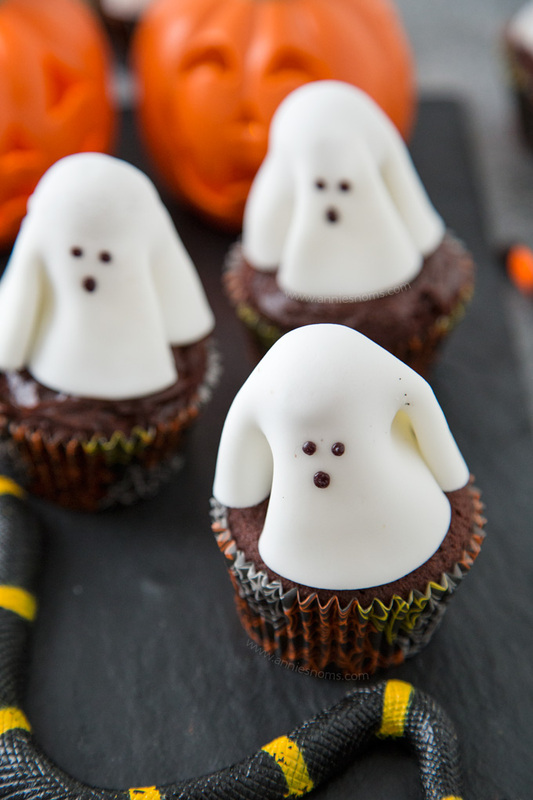 These Ghost Cupcakes are super fun to make and just perfect for Halloween! A chocolate frosted cupcake with a fondant ghost atop it; these are treats that adults and kids alike will love! Well, hello there! 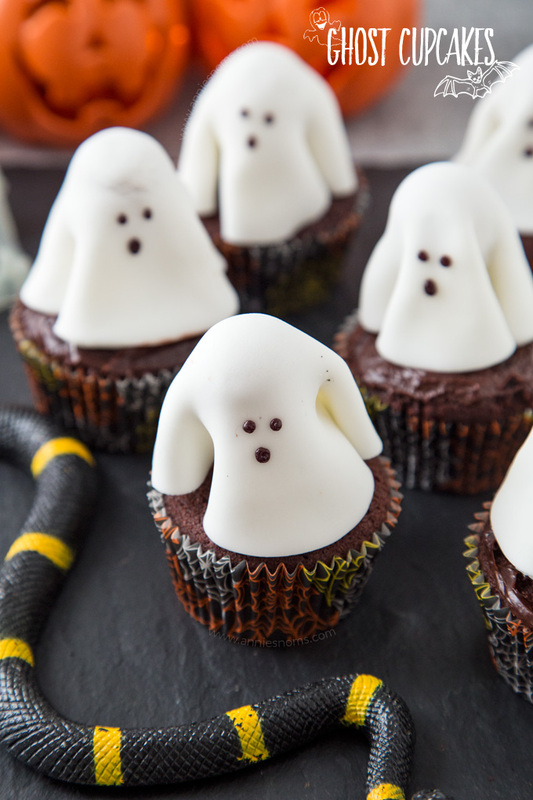 Under a week to go until Halloween (I can’t believe it either) and I decided that we could all do with some Ghost Cupcakes! 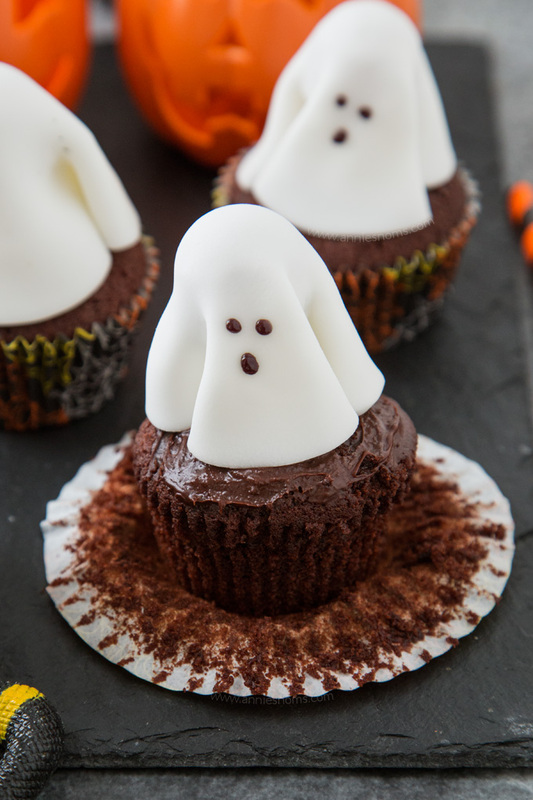 Rich chocolate cupcakes, with chocolate frosting and a ghost sitting on top of them. 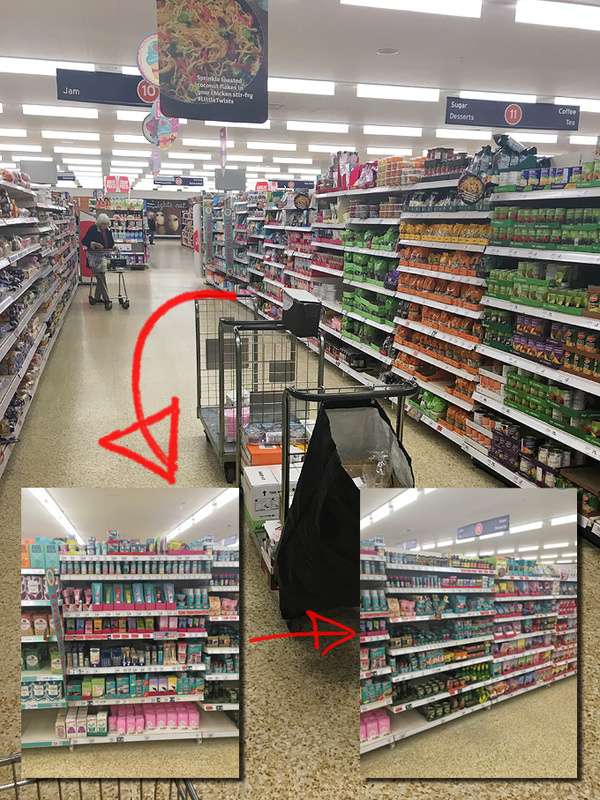 So, I headed to my local Sainsbury’s and picked up some white fondant, chocolate frosting, black writing icing and lollipops to help shape the ghosts. I had such fun making these Ghost cupcakes although I will say, at first I struggled shaping the fondant over the lollipops! Once I realised it was easier to shape them over the lollipops before placing them into the cupcakes, they were super easy to make! I whipped up a batch of my favourite chocolate cupcakes and then topped them with chocolate fudge frosting. For the ghosts, I got some lollipops and then trimmed down the sticks slightly – I tried the first cupcake with a full length lollipop, but it was just too tall and the ghost was twirling about and “floating”! Haha, much better once you trim an inch or so off the lollipop stick! Like I said, at first I stuck the lollipop into the cupcake and then tried to shape the fondant over the top, this didn’t work, so I began to shape the ghost around the lolly first and then put it into the cupcake. It was very simple to make the ghosts themselves; you just need a 4 inch round cutter. Once they are all stuck in the cupcakes, I used black writing icing to pipe on some eyes and a mouth. You could of course use chocolate chips and mini ones, but mini chocolate chips are not readily available in the UK! And there you have it! 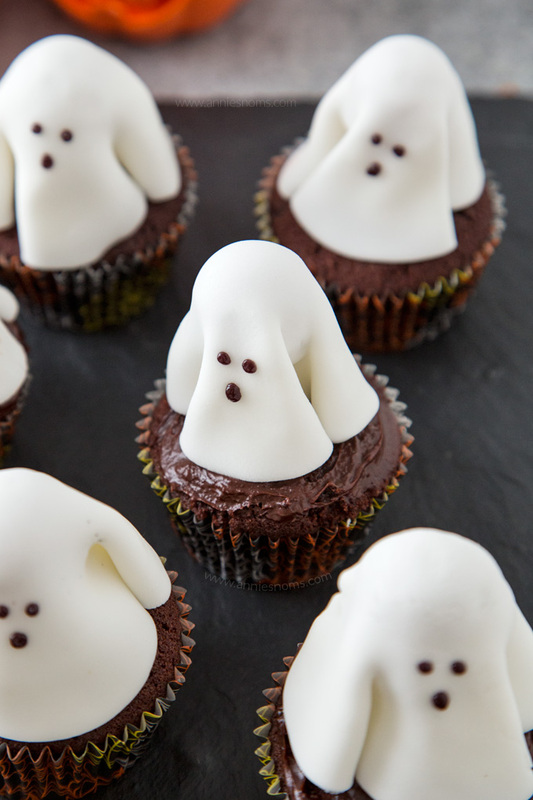 Cute and fun to make Ghost Cupcakes for Halloween! Stay tuned for more Halloween recipes tomorrow and Thursday! 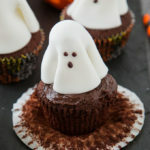 Ghost Cupcakes - Fun Halloween Recipe! A chocolate frosted cupcake with a fondant ghost atop it; these are treats that adults and kids alike will love! Add in the oil, eggs and vanilla extract, scraping down the sides of the bowl and necessary, and mix until well combined and smooth; around 1 minute on med-high speed. 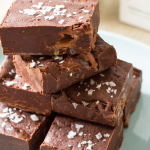 Add in the flour, cocoa powder, baking powder and salt and start to mix on low until mixture starts to come together. 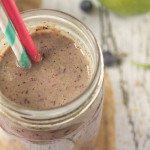 Add in the milk and then mix on medium speed until well combined and smooth. Divide the mixture between the cupcake liners, ¾ full. I use a level 2tbsp cookie scoop to fill my cupcake liners evenly. Place in the oven for 18-22 minutes until risen and an inserted skewer into the centre comes out clean. Transfer to a wire rack to cool as soon as possible; I find this stops the liners from getting greasy and peeling away from the cakes. 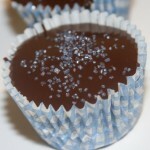 Once cool, spoon a little chocolate frosting into the centre of each cupcakes and spread with the back of a teaspoon. Sprinkle your worktop with icing sugar and then roll out your white fondant until it’s 1/8 inch thick. Use a 4 inch round cutter to cut rounds out of the fondant. Cut as many as possible out of the fondant and then re roll and cut the rest. You will have just enough to make all 12! Take a lollipop and place the tip of the lolly into the centre of a fondant round, then pick it up and flip it so the lollipop is the right way up and the fondant is on the top. Coax it around the lolly and pinch and fold gently around the sides until the stick is covered and you have 3-4 pleats. It should look like a ghost costume you would have made out of a sheet as a kid! Stick the lollipop into the centre of your cupcake and repeat until you have 12 Ghost Cupcakes! Ghost cupcakes will keep in an airtight container, at room temperature for 3 days. These are so perfect for Halloween, simple and delicious. What a fun idea, thank you! Haaa did you buy them out of fondant icing?! Love your little ghosts! These are adorable. What a fantastic idea to use lollipops to make the ghost shape. What a really cute idea for Halloween! Thanks for the clever cupcake. I absolutely love your little ghosts! 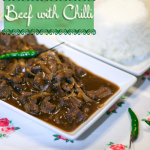 They are perfect for any cool Halloween party 😀 Saved for later! these look so cute. A simple, but very effective idea. Very cute! I love working with CB!